This idea comes from my good friend, Sarah. It’s so simple and so delicious. 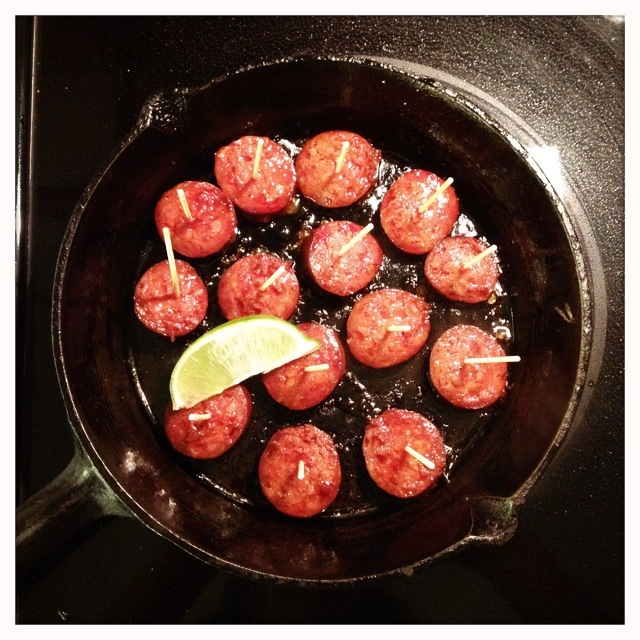 I bought the chorizo at Oyama Sausage at Granville Island; I particularly love the red wine chorizo. 2. Heat a frying pan. Put the sausage in it. Fry on each side until slightly browned. 3. Use the paper towel to soak up the fat. 4. Squirt lime over the sausages, then put a toothpick in each one. I served them right out of the cast iron frying pan so they would stay hot. Yum. I do love my chirizo!